SO tomorrow is the Nordstrom Anniversary Sale and it seriously feels like I am a kid on Christmas Eve, I cannot wait! Click here to read all the tip and trick, basically everything you need to know about shopping the sale. I am hoping to have a blog post up on Thursday with all my top picks, recent purchases or a try on session similar to this one last year. If you have any questions regarding the sale feel free to leave a comment or send me an email at TheBlackBarcode@gmail.com so I can help you out and get that answered! As for this outfit, these mules are to die for and under $20! I have been loving the mule slide trend so much lately I recently picked up these fun ones which I am sure you will see a whole outfit post on soon enough! Lastly, I am wearing a sweater tank I picked up on major sale last Fall, sweater tanks in Summer?? I know, I was thinking the same thing, but they are a huge trend this seasons at shops like Madewell, Loft, Old Navy and J.Crew. What are your thoughts on this trend? That denim is absolutely perfect! I love the tones in this outfit. This outfit is killer! Love this pair of denim on you! Gorgeous babe! Loving those jeans! I am swooning over those sunglasses! SO CUTE! Those mules are so cute! Love the color. Also, love that pearl necklace with your summer sweater. Love your entire outfit! So cute! 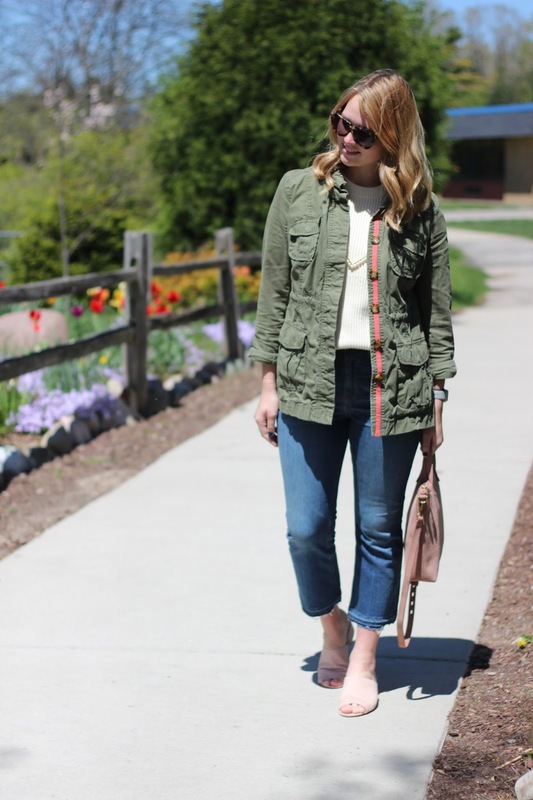 Love the summer sweater and utility jacket! Such a great look! this bag is gorg! love the pink suede! I love the Nordstrom sale myself!!! I already got a few good stuff! That sweater tank is such a great staple, it looks so luxe!